Twenty five years ago on a midweek late August night, Sonic Youth and Nirvana rolled into Dún Laoghaire, or technically the ancient end of the town that was essentially a sleepy fishing village until the construction of the harbour and the railway changed everything. Now, the Top Hat is another block of apartments opposite the Purty Kitchen. It hosted seminal shows by The Clash, Patti Smith and Metallica back when hardly any international acts came to Dublin or Ireland, whatever about Dún Laoghaire. But it was the arrival of a then unknown Nirvana (on this side of the Atlantic at least) alongside alt-rock gods Sonic Youth that is still the most talked about and famous Top Hat gig a quarter of a century later. It even gets mentioned in a brochure from the DLR tourist office. I wasn’t at the show as I was on holidays in Donegal, swimming and listening to John Peel on FM (perk of being close to the border pre-digital), but I’ve heard a few eye-witness reports. Nirvana were by all accounts a stunning blast of noise and melody and played six songs and opened with ‘Smells Like Teen Spirit’ a few weeks before its release. The trio then went into the crowd to watch Sonic Youth. I’ve heard that the late Kurt Cobain was very friendly and engaged with whoever said hello or complimented his band. About two short weeks later on September 10, Nirvana released a single called ‘Smells Like Teen Spirit’. Everything changed very quickly. Nirvana are now rightfully regarded as one of the last great guitar bands who changed popular culture with an astonishing that continues to inspire to this day. I’m going to point you towards a pristine recording of ‘Smells Like Teen Spirit’ from their appearance in Sir Henry’s, Cork the night before, plus their itinerary for the Irish tour and set list for their forty-minute Top Hat appearance. Finally, enjoy this fascinating short audio interview with Kurt about discovering his Irish roots on this tour, plus a link to an interview I did with Krist Novoselic on the 20th anniversary of Nevermind here. 18/08/91 – Nirvana meet up with Craig Montgomery, John Silva and David Markey at Los Angeles Airport at 10.30am to fly to Heathrow in England. 19/08/91 – They arrive at Heathrow at 7.30am and meet up with Sonic Youth and travel to Wales on two coaches to catch the ferry to Ireland. 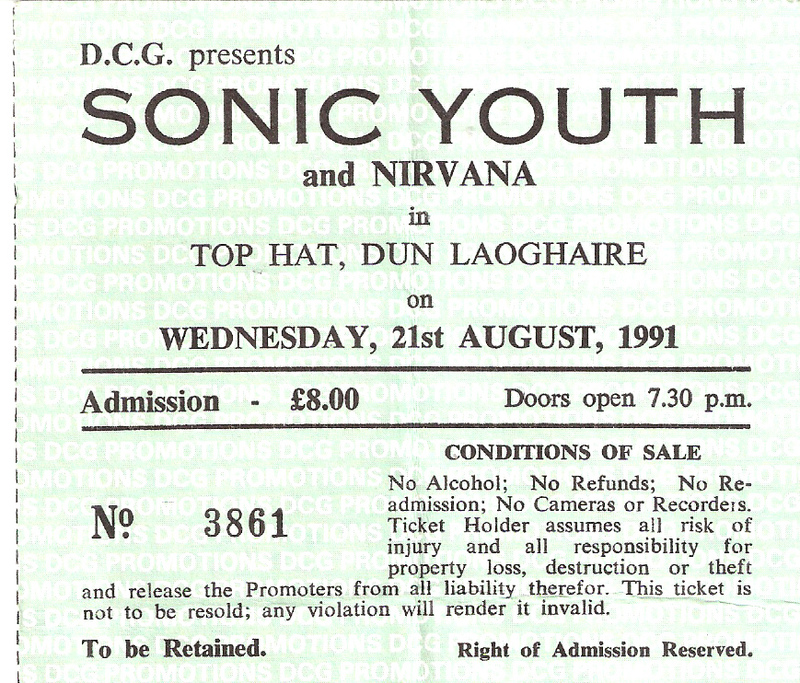 20/08/91 – Nirvana start a two-week European tour with Sonic Youth at Sir Henry’s Pub in Cork, Ireland. The two bands stay at the inn attached to the club. The first three songs listed are the first three the band played of a 40-minute set, according to an attendee. Kurt reportedly screamed his way through ‘Sliver’. Yeah, there were no other support bands that day. I was outside the side door drinking cans listening to Nirvana and Sonic Youth soundcheck. I was in for all bands. Dinosaur Jr were doing some other european dates with Sonic Youth/Nirvana but they played McGonagles the following week. I remember buying a Nirvana t-shirt off the stand at the back and Krist was there – found out later it was his girlfriend selling the merchandise.